This document describes the steps required to correctly calculate and measure the motor revs/inch ratio for your machine. It further explains how to check and/or correct these values in the parameter settings of a Centroid CNC Control. A known accurate measure (for the example a 10" gauge block will be used). 1. Calculator, pen or pencil. 2.
screen. F1 − Setup, F3 − Config, Enter the password 137 − Enter, F2 − Machine, and then F2 − Motor. 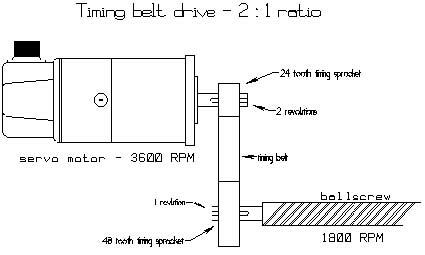 Enter the current ratio values into the chart below for Motor Revs/Inch. 2. Using the following formula, calculate and enter the correct motor revs/inch value in the machine parameter screen as shown above. Example: See Diagram 2 on next page. Note, this method assumes that the pitch and gear ratios are known. It is not uncommon that slight corrections based upon a measured test produce more accurate positioning throughout the entire axis travel. However, entering a Motor revs/in value based upon stated specifications should eliminate any gross errors. Secure a 10" gauge block to the table. 1. Indicate one end of this block and set a part zero. Use probing cycles if you have this option. 2. Find (or probe) the opposite end of the block and record the distance the DRO displays. 3. Using the formula below, calculate the new motor revs/inch value: 4. From the Machine Configuration, press Motor and use the arrow keys to change the values Motor revs/inch. Press Save to accept the changes. Repeat the measurements again to verify that the new settings are correct.